Cyclists searching for a quick way to secure the bicycle when left unattended may be interested in a new lightweight bike lock aptly named the Quick Stop. Designed by Mark Waldin based in Seattle the Quick Stop has been designed for our modern lifestyles and is quick to install lightweight and comes with its own companion application. Watch the demonstration video below to learn more about the bike lock which disables the bicycle’s handlebars if broken. – Installs easily to your bike’s steering tube below the handlebars. – Goes everywhere you go because it’s built-in. 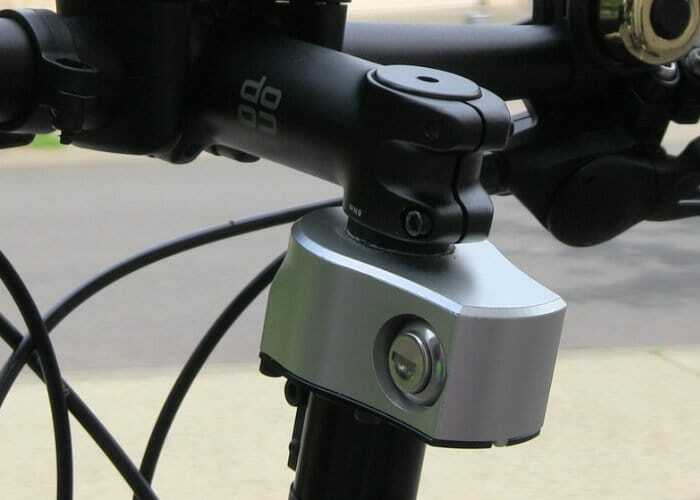 – Disconnects handlebars from wheel to render your bike unrideable when locked. – Sends a phone alert the instant your bike is moved. The Quick Stop Bike lock is now available to back via Kickstarter with early bird pledges available from $60 or roughly £46. If the campaign is successful and production progresses smoothly worldwide delivery is expected to take place during March 2019.